Rovinj, is situated north of Croatia's Dalmatia coast. Rovinj is a picturesque fishing town, which retains a strong Italian flavour with cobblestone streets and a central promenade. Rovinj is a popular tourist resort with a warm, Mediterranean climate. Ferries from Rovinj are sadly currently unavailable. 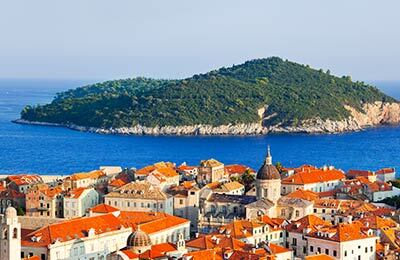 However you can use the booking form to the left to find ferries that operate similar routes or find a complete list of all ferries to Croatia. Below, you can find all Rovinj ferry times, as well as our best deals. Atlas Kompass operates two modern ships with outdoor decks, air-conditioned seating areas and a bar serving refreshments and snacks. Duty free shopping is available on board. Venezia Lines has a fleet of 3 high speed catamarans equipped with the latest technology of air cushions combining the advanced characteristics of catamarans and hovercrafts. When on board any Venezia Lines ferry you can expect to find facilities such as spacious and executive style air-conditioned lounges, bars and restaurants along with tax free shopping. Rovinj ferry port offers a range of services and facilities. The close proximity of Rovinj ferry port to Rovinj's town centre means passengers can easily access local amenities. 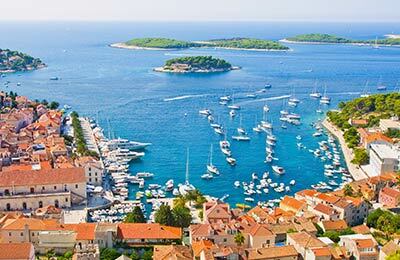 Rovinj, is situated north of Croatia's Dalmatia coast. Rovinj is a picturesque fishing town, which retains a strong Italian flavour with cobblestone streets and a central promenade. Rovinj is a popular tourist resort with a warm, Mediterranean climate. The town of Rovinj dates back to the 2nd-4th Century, and comprises features Medieval foundations and Venetian architecture. Today Rovinj has approximately 15,000 inhabitants and is a prominent town and port. Rovinj is rich in history; you can see the ancient town walls dating from the 13th-18th Century, the Renaissance clock tower and the old town gate Balbi's Arch, which dates from 1680. Other activities on offer in Rovinj include visiting the St. Euphemia church, the town museum and walking in the many beautiful and scenic parks Rovinj has to offer. Entertainment in Rovinj includes a casino, shops and restaurants.